Fresh cubes of slaves await! Several barebone cave towns near the brain chamber are awaiting conquest. Towns can be populated by Humans, Elves, Dark Elves, Grimlocks, Gnolls and Orcs, (which can be impregnated), and Halflings, Dwarves, Dark Dwarves, Gnomes, Dark Gnomes, Giants ands Centaurs. Players start with four members of random species, from which /at least/ two allow impregnation. As the plan is to bestow the flayer with its bodies old powers, this will give each play a slightly different experience. When chambers grow too big, they automatically become hallways (the brain chamber started to bleed into every single nook and cranny). Soon our Flayers can enslave, impregnate, eat, trade, and exterminate, but to get there, the potential slaves need a brain, and a way to fight. Besides impregnating the unlucky spelunkers who end up as your first flayers, and digging in dirt, the player does not have a lot to do yet. Not very exciting, so lets spice it up a little. A dozen races, each with their own initial feeling towards Flayers. After that is in place, we can start add ways to interact with the villages. (Be it enslave, impregnate, eat, trade, or exterminate). Finished! Just point at the master brain, (S)elect -> (I) Impregnate, hover over a slave in the green sludge, and type enter. This will instantly transform the slave into a Flayer! Chamber function now functions too, as you can see on the picture to the right. The chamber with the master brain is filled with a green sludge, while all other chambers are flagged as hallways. There is a lot we can improve here, like balancing the number of flayers, slowing and animating the impregnation (flotch! blood, wheee! ), adding some crawling vulnerable Larvae in the chamber, etc, but lets keep that for later and focus on adding some more things to do. Time to get some basic game elements into Elder Brain. The game starts with Mind Flayer reproduction: Ceremorphosis. Larvae are inserted into the brain of a sapient creature, consume the brain of their host and become sapient on their own. In effect, the player chooses the bodies of the Flayers, and the powers that come with that body. Brain Chamber, from which the master brain can impregnate slaves or thralls. A couple of potential slaves, that happen to stumble into the Brain Chamber, to start the game. Menu, so the player can tell a being (in this case, the master brain) to perform certain actions. 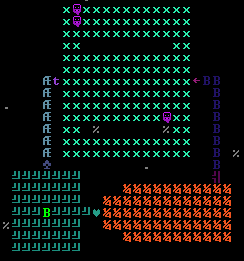 My main goal is to create a game that explores some ideas that have been swirling around my head while playing Dwarf Fortress. It’ll be the flavor as Dwarf Fortress, but certainly not the scale. Basic concept: You play Elder Brain, lord of the Mind Flayers. Your loyal Mind Flayers tend to your fragile body, and act as masters to your workforce of slaves. It is your prerogative to grow the colony how you want it. Can you keep your flayers happy? Will you capture dwarfs to build your fortress, and let your flayers feed upon gnomes? Will you torture your slaves to keep them obedient but broken, or will you treat them fairly? The dynamic between the elder brain, flayers the various slave races and monsters. Each has their own needs and quirks. I’m interesting in bringing the Mind Flayer lore to life. Building an underground domain, quickly. Assisting the player with templates to plop down and providing a uniform user interface should help getting it all set up faster. I’m avoiding features that already exist in DF. I’m interested in the digging, logistics, graphical feel, interaction and make your own story aspects of DF. To address the big giant trashing about the playground: Elder Brain is to Dwarf Fortress what fan art is to Anime; horribly deformed, out of tone with the original, but still fun to make! Anyway, I’ll post my insights as I go along, I hope someone can benefit from the knowledge. If you haven’t played this little gem yet, give it a try! This eccentric Dungeon Keeper meets Roguelike has kept me entertained for the last few days. Putting all his weight behind the game mechanics and totally ignoring the graphics (yay to him! 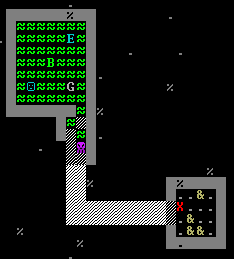 ), the author of Dwarf fortress has created a compelling place for your little dwarf colony to prosper, and eventually die horrible (but entertaining) deaths. It’s given me a coding itch I have to scratch. Given that Dwarf Fortress isn’t open source I’ll have to put my effort in a separate creation; Elder Brain. more about it later.